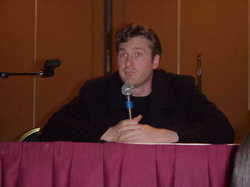 David Kaye, is a Canadian-American voice actor. He is best known for his roles in animation, including Megatron in five of the Transformers series (Beast Wars, Beast Machines, Armada, Energon, and Cybertron), Optimus Prime in Transformers: Animated, Professor X and Apocalypse in X-Men Evolution, Cronus in Class of the Titans, Khyber and Shocksquatch in Ben 10: Omniverse, several characters in Avengers Assemble, Reginald and various other characters in Regular Show. He is also well known for his work on English versions of anime, his notable roles being Sesshomaru in InuYasha and Treize Khushrenada in Mobile Suit Gundam Wing. He provides the voice of Clank in the Ratchet & Clank video game franchise and the feature film. His voice is featured in the Academy Award-winning Disney/Pixar movie Up and he is also the in-show announcer for Last Week Tonight with John Oliver on HBO.